Keep your big dog busy and get deep cleaning at the same time, give your dog PEDIGREE® DENTABONE® today. It's clinically proven to reduce plaque and tartar build-up. With its unique bone shape and abrasive texture, it deep cleans to reach even the least accessible teeth. 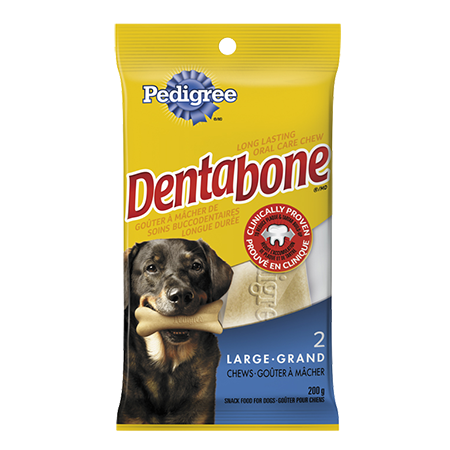 PEDIGREE® DENTABONE® Long-lasting Oral Care Chew for Large Adult Dogs is rated 5.0 out of 5 by 3. Rated 5 out of 5 by Monette from Pedigree Dentabone I am buying this kind of DentaBone. My dog loves it ...and I usually buy 4-5 boxes at the time in case I would run out...now I am down to the last one and I looking around to buy some more and I don`t see any. Yes my dog loves them and very good for her teeth. Rated 5 out of 5 by HoneyBear from Lexie loves them Lexie loves them she takes them ans into the living room. She usually chews themright away if not she Burys them in the couch! Feed PEDIGREE® DENTABONE® snack one per day according to the feeding guide below. Medium and large adult dogs weighing over 25 lb (11.3 kg) 1 large PEDIGREE® DENTABONE® snack per day. Giant adult dogs 1-2 large PEDIGREE® DENTABONE® snacks per day. RICE, SODIUM CASEINATE, RICE FLOUR, VEGETABLE OIL, TAPIOCA STARCH, NATURAL POULTRY FLAVOUR, PROPYLENE GLYCOL, WHEAT BRAN, CALCIUM CARBONATE, DICALCIUM PHOSPHATE, POTASSIUM CHLORIDE, SODIUM TRIPOLYPHOSPHATE, MICROCRYSTALLINE CELLULOSE, IODISED SALT, POTASSIUM SORBATE (A PRESERVATIVE), CHOLINE CHLORIDE, BHA/BHT (A PRESERVATIVE), EUCALYPTUS FLAVOUR, ZINC OXIDE, VITAMIN A, D3 AND E SUPPLEMENTS, ZINC SULPHATE, IRON SULPHATE, MAGNESIUM OXIDE, d-CALCIUM PANTOTHENATE, NIACIN, COPPER SULPHATE, RIBOFLAVIN, PYRIDOXINE HYDROCHLORIDE (VITAMIN B6), THIAMINE MONONITRATE (VITAMIN B1), FOLIC ACID, VITAMIN B12 SUPPLEMENT.